If Apple’s decision to remove the headphone jack on the iPhone 7 is any indication, then wireless headphones are going to be increasingly important over the coming years. Headphones have felt the effects of Moore’s law – becoming cheaper, and better at the same time. 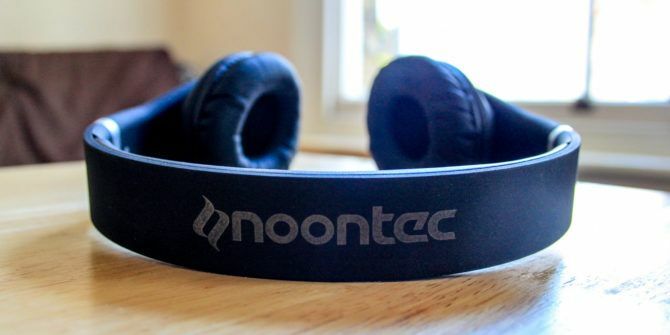 Australian headphone manufacturer Noontec is a good example of that principle. The specifications for the recently released Zoro II Wireless headphones (UK/CA) put them not a million miles away from the performance of much more expensive sets. So then — how do they stack up? The Zoro IIs are well designed. They sit nicely between fashion headphones and a more standard set. The design is understated and all the better for it. The model I reviewed was “volcanic rock”, but they also come in all black, and black/red variations. Like most wireless headphones, they have the controls built into the earpads. The volume buttons are on the right earpad, with the power/play button and charging indicator on the left. There is a padding along the inside of the headband for added comfort. Along with the headphones themselves, you also get a travel case, a micro-USB charging lead, and 3.5mm audio cable. The audio cable can be connected to the headphones in case you run out battery but want to continue listening. The product FAQs on Noontec’s website make the distinction that these are on-ear rather than over-ear headphones. This means that the sit on top of your ear, rather than surrounding it. This is fine for shorter uses like going to the gym, or on your commute, but for longer usage it leads to soreness around the ears and the possibility of tension headaches. The folding mechanism means that you can easily transport and store them. Frustratingly, even in a full folded position, it’s quite a tight squeeze to fit them into the travel case. It’s one of a few ways that the overall build quality of the headphones doesn’t live up to expectations. The plastic body comes off as feeling slightly cheap, and not deserving of a set of headphones costing around $100. This cheap plastic design causes some issues with the folding mechanism, making it very harsh to fold and unfold the headphone arms. The sharp corners make it all too easy to trap your hand in the mechanism — which I managed to do several times. Perhaps most tellingly, after only two days of use, the Noontec badge on the right earpad fell off. Disappointingly, it looked as though it had only ever been attached by double-sided tape. Of course, the main reason to buy any set of headphones is for the sound quality and the Zoro IIs don’t disappoint. For their relatively low price point, you’d be forgiven for expecting less-than-stellar sound reproduction, but happily that’s not the case. Instead, they almost perfectly reproduced every track I threw at them. Even across a variety of songs and genres from hip-hop, electronic, and heavy metal I could enjoy every track. I’m a bit of a podcast addict, and even with voice-only tracks the headphones performed above my expectations. If you are a lover of bass-heavy headphones, then the Zoro IIs might not be for you. Their bass reproduction is good, but you aren’t going to be getting earth-shattering drops from them. The headphones connect via Bluetooth 4.0, storing up to eight connections in their memory. A nice touch is the ability to connect to two devices simultaneously, allowing you to switch seamlessly back and forth between two sources. I found the Bluetooth connection to be quick and stable. Over the testing period, the headphones didn’t randomly disconnect or suffer from interference. Another nice feature is the ability to speed up the pairing and connection process by using the in-built NFC chip on the left ear cup. You only need to tap the headphone against any NFC enabled device and it turns on the Bluetooth, pairs the device, and connects it in a matter of seconds. The Zoro IIs have an in-built microphone so they can double as a handsfree headset for your phone. I made and received a number of calls and found the experience great. However, the other people on the call didn’t find it quite so blissful. They reported that they could barely hear me, the background noise was too high, and my vocals were too muffled. The effect was so bad that I was forced to disconnect the headphones on a couple of occasions and take the call directly on my phone. According to Noontec, you should be able to get around 35 hours of battery life out of the Zoro IIs. I found that this was accurate, and may even be selling the headphones short. If you’re anything like me, you probably find the idea of having to charge yet another gadget as part of your daily routine less than appealing. So then you’ll be pleased to know the Zoro IIs won’t cause you any headache. You’d probably call me heavy user anyway, and then even more so for the review. On average I’d say that I wore them for around 4 to 5 hours per day and only had to charge them once a week. With more regular usage you may only have to charge them once every 10 to 14 days. The recharge time is around 30 minutes too, making the process of charging less of a hassle. The Zoro II Wireless headphones are incredibly good value. They are reasonably priced against the competition, but taken on their own merits the build quality is slightly disappointing when you are spending around $100. That said, in battery life and sound quality they excel — exceeding expectations of what a $100 set of wireless headphones can deliver. Explore more about: Headphones, MakeUseOf Giveaway. The NFC pairing is a great addition.